Kevin Liu | Tech Layoffs: How Bad Is It? 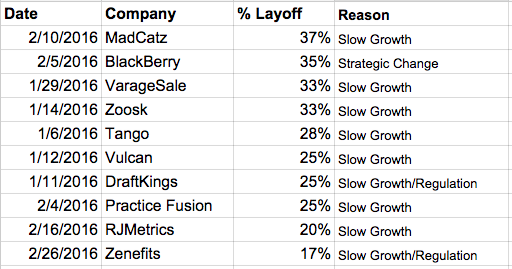 Tech Layoffs: How Bad Is It? tl;dr: Despite flood of layoff news on, the situation isn’t that bad (yet!). 2016 is off to a rocky start here in peppy, optimistic, techland – at least according to the media. News of Down rounds, Layoffs, and Shut Downs consistently bubble to the top of Twitter feeds – the Hangover is beginning. As The Wall Street Journal points out adeptly, “with valuations falling, the other side of the equation is reappearing: Failure is often just around the corner.” Analysts, such as Global Equities Research’s Trip Chowdhry, go a step further and have forecasted 330,000 layoffs in the coming months. For fun, here’s a small appetizer of the sensational headlines. Even if you don’t buy into the media fanfare, (Google News ~ 661,000 results! ), what we all seem to agree is that ‘something’ is happening. Investors, both big and small, have tightened up their wallets, and startup operators are moving mountains to slow the burn and adopt the Watney Rule – the next shipment of potatoes might not come. Despite the optimistic job growth numbers from the US BLS, the market for tech jobs seems to be slowing down. Unsatisfied with the news, I dug into some data. The results, after plowing through hundreds of news articles, is surprising – I anticipated more layoffs announcements. There were 112 layoffs, company shut downs, and completed bankruptcies in the first 60 days of 2016 (that’s all I could find, if you know of more, add it to the spreadsheet!). Most were public, PE-owned, or subsidiary companies of larger corporations. These were not too surprising – Yahoo (laying off 15%), and GoPro (7%) have been in a downward spiral for months, EMC/VMware (~ 900 employees) is dealing with the Dell deal, and IBM is always laying off people. Only 30 were private, venture-backed companies. Almost half of these were late stage companies, often a few years from going public, that couldn’t raise more money or are suffering from slower growth. Notably: SurveyMonkey (13%), Tango (28%), Kabam (8%). The other half of this cohort are mostly Series B/C companies that are at the inflection point – transitioning from solely chasing after audience to generating real revenue numbers. Notably: Birchbox (20%), Mixpanel (8%), VarageSale (33%). Regulatory risk is real for tech companies. FanDuel, a daily fantasy sports company that’s come under fire from state policymakers, let go of 55 employees early February. Over in insurance world, Zenefits said goodbye to 17% of its staff (mostly in sales). Anecdotes always have the uncanny ability to make things seem worse than they might actually be. However, from what we’re seeing thus far in 2016, the effect of this slowdown has yet to signal catastrophic disaster. Additionally, effects of layoffs could take months or years to take to materialize – it’s cheaper to stagger out those exits. The bottom line is that companies that have great execution and appropriate risk management measures will continue to raise money and create jobs even in uncertain times – for comparison, in the same time those layoffs happened, we saw about 800 companies get checks. Evidently, there is still optimism for the coming days. In the coming weeks, I’d like to compare the first 60 days of 2016 with 2015, and so forth. Additionally, I’ll dig into some data to see which companies might be next. Stay tuned. Thanks to those who were gracious enough to proofread this. Also, shout out to Mattermark research analyst, Ho Yeung, for helping me sift through the data. A modified version of this appeared on Mattermark.